Obituary – Evans, Larry Gordon « Perry High School Alumni Association, Inc.
﻿Football 50-54; Perryscope Staff 53-54; Annual Staff 52-54; All School Revue 51-54; Teen Town Council 53-54. ﻿Larry Evans, 58, died at 12:25 a.m. Thursday, May 5, 1994, at his home at 1306 Boundary street. Funeral will be at 2 p.m. Saturday at the First United Methodist church. Rev. Cortez Cranfill will officiate. Burial will be at Grace Hill cemetery under direction of Brown Funeral home. 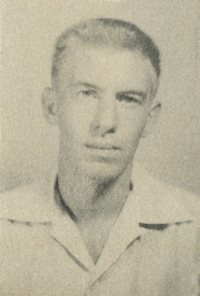 Evans was born in Oklahoma City on March 8, 1936, the son of Dr. A. M. and Alameda Evans. He was a 1954 graduate of Perry high school and served in the U.S. Coast Guard from 1958-60. He had been employed in oilfield construction work. He and Judy Dawes were married in Miami, Okla., on March 8, 1990. Evans was a member of the First United Methodist church. In addition to his wife, of the home, survivors include three sons, Perry and Brent, both of Fort Worth, Texas, and Nathan, of Augusta, Ga.; one brother, Dr. Gary Evans, Muskogee; and one sister, Ann Wakeman, Edmond.